Diana Hobson is an artist working with nature and the environment. I love to listen to the natural world speaking. What I hear informs my work. I listened to the river as I filmed it over the course of a year. And in the redwoods I heard the trees crying for Humanity to become a partner, and to understand how we are inextricably connected. In the Arboretum at the University of Santa Cruz, California, an environmental art piece merges into the landscape, offering a quiet place to sit, to listen to the sounds of nature and to meditate ( see below and Projects page). Video installation and new art book at Saint Mary’s College Museum of Art. Moraga, California until August 26th 2018. The book of poetry and ‘River Writing’ is the result of a year spent filming the San Lorenzo River in 2002/3. It accompanies the video installation at Saint Mary’s College Museum of Art. 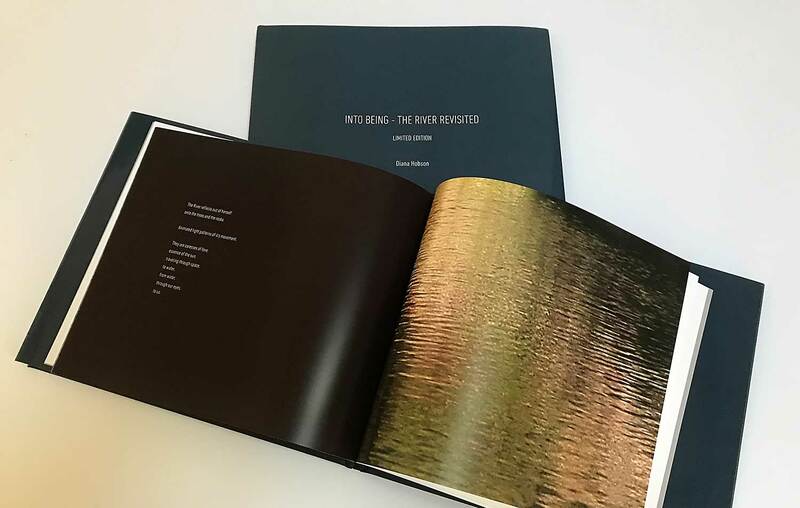 The book, INTO BEING – THE RIVER REVISITED, in a limited edition of 20, can be obtained from the artist. ‘Ubiquitous Seed’ is a thirty-foot/nine-meter diameter circle of radiating arcs, echoing the Ancient Egyptian symbol for the seed. At it’s center is a ‘sitting stone’, a quiet place for one to step out of the mayhem of our world. Take the pathway leading to the center to sit, to contemplate, to meditate, or to just be. The initial inspiration for the work arose from a concern that we are losing the essential diversity and quality of our seeds. Seed Banks holding the worlds precious and ancient seeds, crucial to our healthy survival, are being destroyed in war zones around the world and are now at risk from global warming. As we have seen recently, the global seed bank buried deep in the permafrost at Svalbard, in Norway’s Arctic, was recently flooded by melt water, due to an excessive rise in temperatures in the arctic this winter. Central to ‘Ubiquitous Seed’ is the wider symbolism of the ‘seed of life’ holding the blueprint for a new Humanity, guardians of a vibrant and healthy planet. Sonoma fieldstone, wood chips, (from Cypress trees, victims of recent winter storms) gravel, Rhyolite central stone.